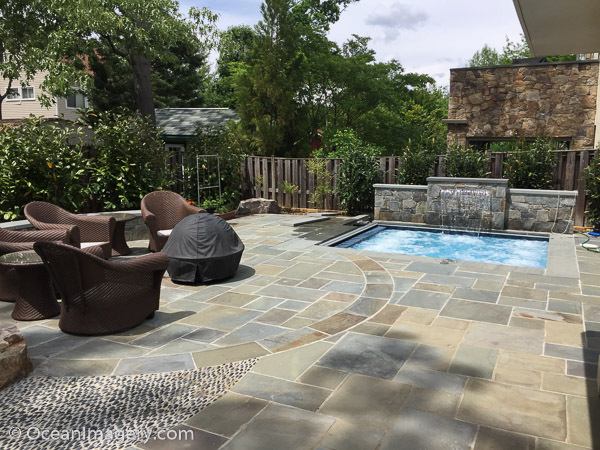 Our finished backyard living space & in-ground spa – Arlington, VA.
After months and months of work, our backyard overhaul and remodeling project is finally complete. We went slightly over budget for this project, but we feel that the extra costs were worth it. Some of the upgrades included recessed lighting, new gates, a large stone walkway and a dedicated stone equipment pad. We also upgraded our deck with the newest Zuri wood composite decking and custom powder coated iron railings. We couldn’t be more pleased with how the project turned out… and we absolutely love our new spa! This is the final installment of photos for our backyard project… enjoy! Getting ready to pour the concrete slab for the new patio & seat wall – Arlington, VA.
A month has gone by since my last post and our backyard makeover project is really coming along. Thanks to the weather, the crew from Land-Art have been able to lay down a lot more stone than we thought they would for this time of year. The colder than average temperatures would have driven me inside and shut the project down for the winter, but not these guys… they are determined to have this project finished before spring. When the temps dropped below freezing for about two weeks, they brought in kerosene heaters and put up a huge tarp, so that they could finish the last of the flagstone work. 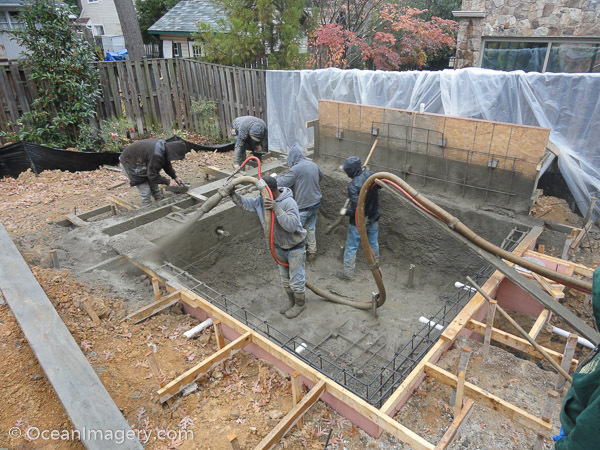 Shotcrete time… our in-ground spa starting to take shape! – Arlington, VA. This is the third installment of photos from our backyard living-space makeover project by Land Art Design and J. Proctor Pools. After several months of work on the project, we were finally ready to shoot the concrete for the in-ground spa. I’ve seen how this is done in videos before, but I’ve never seen shotcrete done in the flesh… it was very interesting to watch. 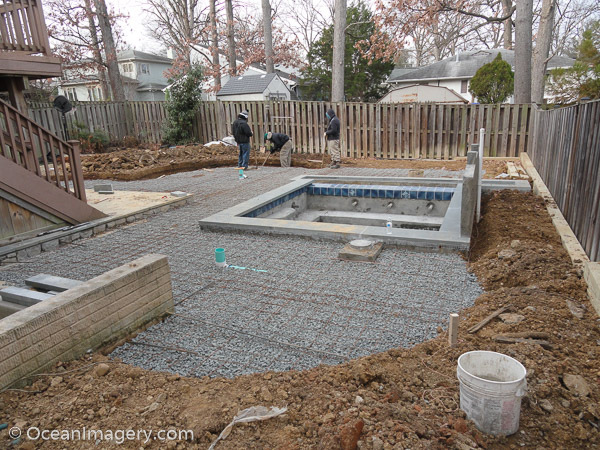 Forming-out & plumbing the in-ground spa – Backyard Project – Arlington, VA. Here is the second installment of photos from our huge outdoor living space improvement project. As you’ll notice, the project is moving along quite well and you can actually see the in-ground spa really starting to take shape. Once all the piping is installed and re-bar is bent it will be time for the concrete guys to do their thing and spray the actual pool. I should have photos of that in my next backyard project post. 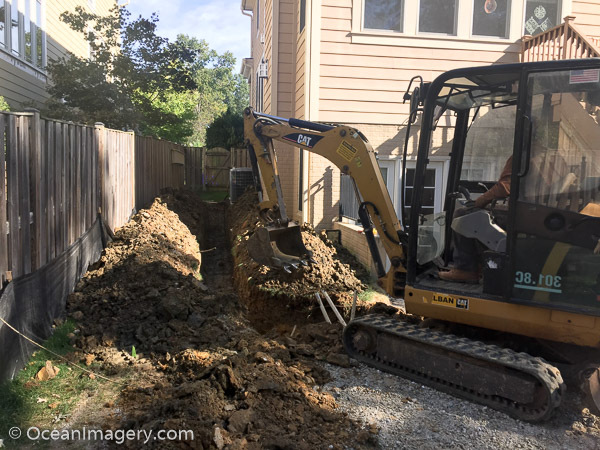 Jesse Proctor ‘breaking ground’ on our new Backyard Spa Project – Arlington, VA.
Well we have finally decided to redo our outdoor living space. We have always wanted to incorporate some type of water feature into our backyard living area, but were told that we couldn’t have a swimming pool due to the storm water retention system located underneath our yard. After months of research and consulting with different contractors and county inspectors, we have determined that the storm water system actually belongs to us and as long as the system if functioning properly we have the right to build over and around it as long as it meets code. 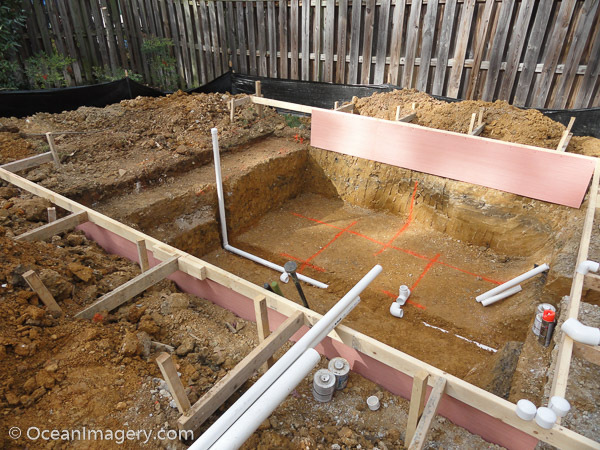 A large pool would not work since the main storage pipes are only 5 feet underground, but we did find that there is enough area beside the system to build a large in-ground spa that we can incorporate into our backyard landscaping project. The project was scheduled to start mid October and take anywhere from 6 to 8 months depending on the weather. I didn’t think it was a great idea starting a project like this in the fall, but I was assured that as long as the pool contractor was able to get the pool formed and shot before the first freeze, the project would stay on schedule. This is my first installment of photos from the project… keep an eye out for more to come over the winter!